Discussion of Tony Abbott's comments forgoets his background as a Catholic conservative., just as Howard's voew reflect his poltical roots in Sydney Protestant conservatism with tis anti-Catholic history, even down to the beleif that Catholicism is abd for women. Just as conservative Catholics were recruited to the poltical right via the DLP after the labor split, Abbot hopes to do the same with Muslims. When he says: 'It's true that not all migrants are predisposed to appreciate current orthodoxies about sexual and gender emancipation'. it is obvious he is doubtful about these orthodoxies as well. Brian Fitzpatrick noted the oddity of the most anti-socialsit church in Europe being aligned with the poltical left in Australia, but more generally this was the case in msot countries of European settlment. yet the catholic alignment with the the left was always tentative, in Canada and the US more observant Catholics were less likley to support the poltical left in the 1950s, Catholcism bolstered left party voting principally when it was ethnic Catholcism rather than religious Catholicism. The analomy of the allaince between devout Muslins and the poltical right is based, as it was for catholics and the ALP, on foreign policy; ireland and Palestine. Socially however devout Muslims belong on the poltical right. Predictable silliness from Peter Costello. He's got bored again a and gone for a random trawl on the Internet perhaps for another political position to adopt, just after 'social liberal' and concerned Christian poverty crusader. The first banner he carried in the late 1980s was 'neo-conservatism' which is attributed to him in Patrick O'Brien's silly The Liberals, at this time it was interpreted as some kind of authoritarian populist moral conservative appeal, that in some aspects foreshowed Howard's appeal. Wouldn't it be better to extend support to the families and compatriots of the 47 Iraqi Muslims murdered by terrorists yesterday? As Christopher Hitchens notes the terrorists are as committed to muderering Muslins as anyone esle. Costello's comments like Howard's will be popular with the self proclaimed 'culture warriors'. A 'culture war' is a war for intellectuals of a particular type, those who prefer endlessly considered what we should think rather than what we should do, and what we should do is to support those struggling for freedom and democracy against dictatorship and terror. At its meeting last night, Monday 20th February, it was reported to the Socialist Left Executive that the ALP National Executive Committee is likely to open nominations this Wednesday for ALP candidates for the Victorian Legislative Council, with the intention of pre-selecting candidates at the National Executive meeting to be held on Friday 3rd March. The pre-selection of ALP Legislative Council candidates was referred to the National Executive by the Victorian Administrative Committee at its meeting of 27th January, in a decision opposed by SL members of the Committee, following the intervention of the Premier. So no ballot, so much for idea of involving giving rank and file Labor members outside Labor seats an opportunity to select a Labor MP. The people who pushed through this decision did not have the courage to argue for it at the last ALP state conference. The role of Labor Senators is generally to act as factional leaders and providers of resources to election campaigns rather than constituency representatives, hence the tendency of Labor senators to cluster in the inner-city, see Peter van Onselen here. The question for the new Labor MLCs will be whether they will follow this role or take a constituency focus, particularly in non-Labor areas. The denial of a local pre-selection vote suggests the former, so much for building Labor support outside the inner-city and old migrant suburbs. Those who opportunistically[??] try to conflate the Danish cartoon controversy with Irving's case should recall that Austria's (and Germany's) anti-Holocaust denial laws are not so much about protecting the feelings of a religious minority as they are a keenly felt attempt to prevent history from repeating itself. As the saying goes, never again. Austria's laws against Holocaust denial, like Germany's, were an emergency measure enacted shortly after World War II. The threat of a Nazi revival could then be reasonably regarded as a "clear and present danger" that would override concerns about free speech. But to make the same argument today is just nonsense. The best argument for the laws, and one I feel sympathy for, is precisely the impact of denialism on a 'religious minority' (a rather strange description of European Jews) and in particular Holocaust survivors, could being a survivor of trauma could change the definition of assault? Fifteen years of Keating PM? Nine of Beazley PM? 2. Substantially more people would have come to Australia under family reunion (really putting 'families first'). 5. The gap between indigenous and non-indigenous living standards would be less (compare the trends apparent in the census of 1991, 1996 and 2001). 6. Indigenous Australians would not have had their property rights trashed without compensation. 7. Australian workers, particularly the low-paid and low-skilled, would have more rights at the workplace. As it stands, American evangelicals remain one of the last social groups in the United states that people can speak disparagingly about in public and get away with...most of those who disparage evangelicals...don't have significant personal relationships with enough ordinary evangelicals to inform their view of what evangelicals are actually like (p.195). Largely I am in sympathy with Smith's argument, and there has been much rubbish in Australia on Christianity and politics . But he never explains the dichotomy he sees between the 'Christian right' and ordinary evangelicals. Political leadership and political outcomes don't simply reflect public opinion. Michael Mann argues correctly that if Hitler had promised world war and genocide he would have been lucky to get 5% of the vote. Most German conservatives were not genocidal anti-Semites but there were elements in their belief system that could be exploited for evil. The refugee policies of successive Australian governments don't reflect public opinion, but they take up and develop elements of public opinion, ditto for Stalinism and Marxism. Progressive political strategies require more than just listing every horror quote from members of a group we fear, but they also require harder political analysis than simple expressions of good will. Smith made me think again whether liberals and the left can find common ground with evangelicals, at the least liberalism has responded to religious belief poorly. Independents' attitudes, in contrast to that of Democrats and Republicans, don't fit neatly into traditional liberal and conservative camps. Instead, by traditional political measures, they often seem to hold contradictory opinions. As a group, they're more and more responsible for California's growing reputation as a green and socially moderate — but also fiscally conservative — state. Polls show that about 60% of California independents favour tougher environmental regulations over economic growth, support a ban on offshore oil drilling and believe that global warming is a serious problem. Independent voters are also among the strongest supporters of such social innovations as medical marijuana use, assisted suicide for the terminally ill, the morning-after pill and hybrid automobiles. They back gay and lesbian marriage by a 20-point margin and a woman's right to abortion by 3 to 1. At the same time, independents are largely responsible for keeping Proposition 13's anti-tax feelings alive. Most say they believe that government "wastes a lot of taxpayer money" and that Proposition 13 was a "good thing," according to the Institute's surveys. Philosophically, independents split from Democrats by favouring smaller government with fewer services and lower taxes. Still, an institute poll in January found independents supporting more money for education and health programs as well as proposed ballot measures to generate funds for healthcare and preschool. One thing we know for certain from this info – as well as from recent election cycles – Republicans can't win statewide in California if they run too far to the right and alienate this vast swing constituency. But what is the lesson here for progressives? Is running as the "Democratic wing of the Democratic Party" the way to fire up these voters? Or are they looking for something new that transcends the current paradigm? Cooper has a Christopher Hitchens style disdain for Clinton but Clinton appealed to these voters (and his legacy has made California safe for the Democrats in presidential elections). I would also like to know more about independent's views on immigration. Does such a constituency exist in Australia, it is certainly represented in the media (see Crikey as an example) and could we interpret the RU486 vote in this framework? I doubt it. Via the Pollbludger a poll predicting that Labor will lose its absolute majority in the Tasmanian election on March 18. At some stage the implications of this poll result (a Green balance of power) will become the object of media fascination (although the media is currently preoccupied by Paul Lennon’s clumsiness); given Labor’s determination to never rely on the Greens how long would they last in minority government? I expect the press would unite in a Green-bashing exercise with Liberal media owners and Labor-voting journalists as one and encourage a panic about political instability that would encourage a late rally to Labor. As Greg Craven notes the media panics about minority governments are curious. Labor's hostility to the Greens in Tasmania is longstanding, there is much hostile commentary about the links between the party and the timber industry see Lords of the Forest), but this hostility also reflects the party's base in resource industry workers. But for all the rhetorical blue-collar romanticism of Tasmanian Labor we have to remember that Labor's aversion to the Greens is driven by electoral experience. After the Labor-Green alliance government of 1989-91 at the 1992 election Labor's Tasmanian vote plunged to 28.9% (down 5.8%) and the Liberal vote soared to 54.1% (up 7.8%). A detailed study of the minority Labor government would be interesting (there is only the 74pp Greening of Government). I always thought that not having the Greens in the cabinet was a bad idea (power without responsibility) but more fundamentally with the Liberals having outpolled Labor 46.9% to 34.7% in 1989 the democratic legitimacy of the Labor government was questionable. The Greens held the balance of power 1996-98 but Labor had no interest in cooperation with them and was rewarded at the 1998 election when its vote rose from 40.5% to 44.8% and it formed a majority government. If parliament had remained at 35 seats (rather than the 25 it was reduced to in a bipartisan Green bashing exercise after the 1996 election) Labor would not have won an outright majority. The argument about Kerry Packer's state funeral today has been done to death. When I think of Australian businessmen I think of Essington Lewis, managing director of BHP from 1925, whose life was brilliantly chronicled by Geoffrey Blainey in The Steel Master. Lewis was a hammer of the unions and an industrial tyrant, but he gave indispensable service to Australia as Director of Munitions 1939-45 and worked very closely with the Labor government. A note pasted inside his spectacle case said: 'Oh Lord, help me to keep my big mouth shut till I know what I am talking about'. Could anyway seriously claim that Packer made a similar contribution to Australia, or that in a similar national crisis he would have similar contribution to Australia as Lewis did during the war? Lewis’ motto of ‘I am work’ would hardly fit a polo player. Perhaps the transition from Lewis to Packer echoes that from Menzies to Howard. For decades, the dictators who ruled (and rule) the Middle East destroyed all political opposition groups. They were particularly aggressive in co-opting or exterminating liberal, secular, forward-looking groups because those were seen as most threatening. They were often less harsh toward Muslim groups, partly because the Islamists were seen as less political. And, of course, you cannot ban the mosque in an Islamic country. Rulers like Anwar Sadat and Jordan's King Hussein often used Islamic groups to discredit the secular opposition. 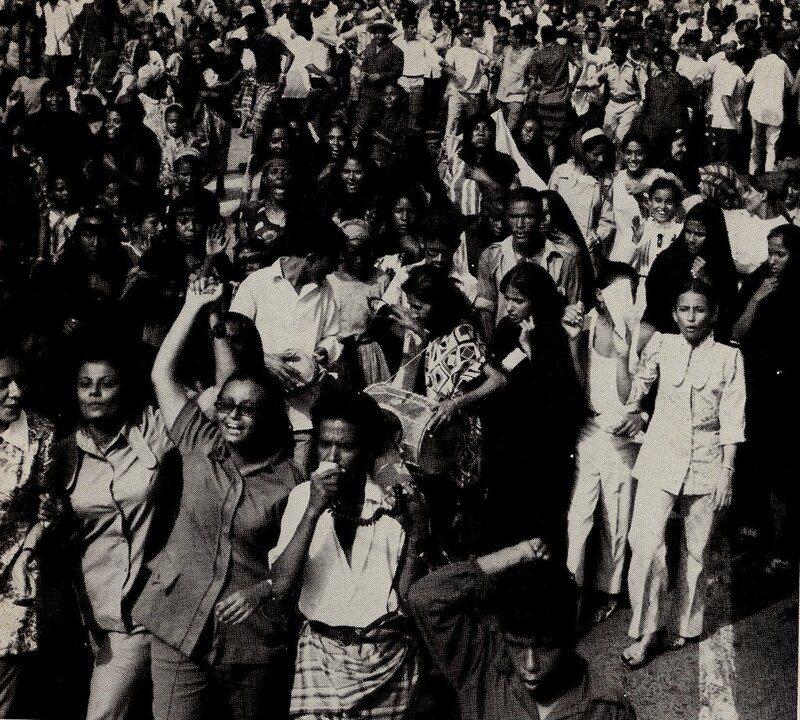 Decades of repression, incompetence and stagnation ensured that citizens got increasingly unhappy with their regimes. And the only organized, untainted alternative was the Islamic movement. I suppose this in an improvement over the nuttiness of Daniel Pipes, but it is surprising that the potential role of workers organisations as a force for democracy is never mentioned, are middle-class secular liberals ever going to win the votes of workers, might it be because their authors of articles such as these are faithful to their own class interest? Communism didn't fall because of middle-class liberals but because of the Polish working-class. :“Thinking about any hardships you might have suffered since the US-Britain invasion, do you personally think that ousting Saddam Hussein was worth it or not?” 77% say it was worth it, while 22% say it was not. Polling results should always be taken with a grain of salt, but it is worth pointing out that just about all the relevant data available from the past four years points in the same direction. By itself, of course, the fact that most Iraqis favored the 2003 war and continue to do so is not necessarily a decisive consideration for the rest of us. However, these figures do offer one more reality check for those opponents of the war who have claimed to be acting on behalf of the wishes and well-being of Iraqis. They should find another excuse. Furthermore, and perhaps more surprisingly: Overall, 64% of Iraqis say that Iraq is heading in the right direction, while just 36% say it is heading in the wrong direction.=> On the other hand, not all the results of this poll are encouraging or reassuring for those of us who supported the 2003 Iraq war. It is clear that the Americans long ago wore out their welcome, and most Iraqis would be happy to see US troops leave--though with significant variations in preferred timing. Given the joys of life under Saddam and Israeli occupation it is not surprising Iraqis and Palestinians vote the way they do. The revolutionary left in Australia have generally denied the significance of polls of iraqi opinion and the high levels of electoral turnout, serene in the conviction that Iraq shows Bush can be beaten. For the revolutionary left however it is activist minorities who make history, hence the bizarre self-delusion that political Islamists simply took a wrong turn on the way to the Socialist Alternative meeting. The Democratic Socialist Party (the major Australian revolutionary socialist organisation) supported the Soviet invasion of Afghanistan, but I doubt this is discussed with their new allies. Still good to see that Socialist Alternative is very concerned about anti-Semitic attitudes in 1921 by the Kronsdat rebels! Some routine reflections by the head of the Department of Prime Minister & Cabinet, Dr Peter Shergold on ministerial responsibility have attracted attention. As head of the department of Education Science & Technology he gave a more interesting address 'DESTiny: looking to the future' in 2002 (no longer on the DEST website) in which he made the revealing admission that bureaucrats now have to compete with external sources of advice, with what I felt was the implication that this imposed constraints on advice, and that he was happy with this. Shergold began his working life as an American labour historian writing a good book on the comparison of working-class living standards in the US and Britain 1899-1913 which concluded that US living standards were not as far ahead as those of the UK as some argued. In Australia he was then associated with the research effort that produced Convict Workers which interpreted convict settlement in Australia in human capital terms. Neither book are what you would expect from John Howard's chief advisor and earlier the head of the Department of Workplace Relations during the governments war on the waterside workers. Still working for conservative governments pays better than labour history. Shergold did enter the public service during the Labor years but he survived the transition well. Both traders came to East Germany as Vertragsarbeiter (contract workers) in the 1980s. Tens of thousands of Vietnamese took secure jobs in state-run industries - a different group from the "boat people" who came to West Germany as refugees. But ever since communism collapsed, they have struggled for economic survival - working 12- or 14-hour days, mostly selling cheap textiles from Asia. "Because these people had to work such long hours they put their children into German day-care institutions - so most of the Vietnamese children grew up with German language, socialisation and culture. While their parents had no time to learn German, for these children Vietnamese is a second language." Has their freedom increased since 1989? That the Warrnambool branch of the ALP believes that the introduction of proportional representation for the Victorian Legislative Council has enabled country ALP members in areas traditionally safe for the conservative parties to look forward to ALP parliamentary representation for the first time in decades and for these ALP members to participate in the selection of ALP parliamentarians. The Warrnambool branch of the ALP therefore calls for Victorian Legislative Council candidates to be selected by a 50% vote of local ALP members and a 50% vote of the Public Office Selection Committee. The branch notes that this position was supported without opposition by the recent ALP state conference. There is speculation that the local ballots will be scrapped and candidates selected by the ALP national executive (or the state executive) where the right-wing Labor Unity faction and its allies have the numbers. 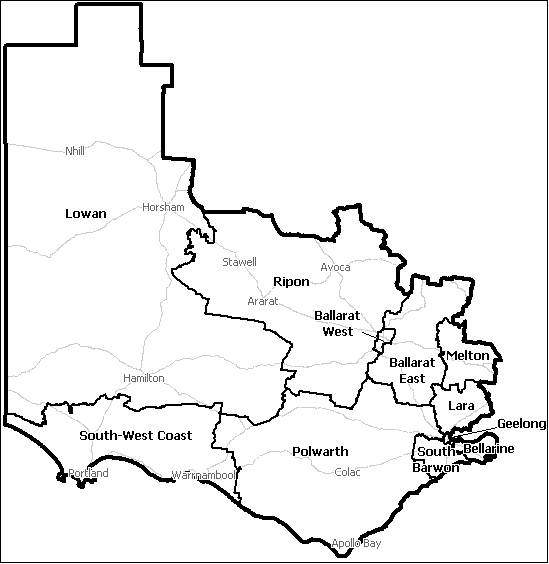 Some candidates for preselection have been travelling across the new Western Province (which includes Warrnambool, see map), such as Elaine Carbines and Gayle Tierney but it is puzzling however that Jaala Pulford from the National Union of Workers (NUW) has been reported as a likely candidate, but has made no local appearances. I have nothing against the NUW one of the few private sector outposts of unionism in south-western Victoria, and maybe Jaala is a great talent (she has many years of industrial experience) but it seems strange she has not sought the support of branch members. Presumably Jaala expects that Labor Unity will dump sitting MP Elaine Carbines (who has actively campaigned among local branch members to her credit) and that this factional decision alone will win her preselection. Does this indicate a confidence that they will be no rank and file ballot or that ALP members in Geelong are so 'stacked' that she can count on a sufficient bloc vote in Geelong to swamp the rest of the electorate? For all the talk of Bracks versus the factions, it is curious that he can't get his own faction to support Carbines. NUW interesting union, its predecessor the Storemen & Packers leapt into prominence in the 1970s as politically moderate but industrially aggressive, and was viewed with fear by employers, see here for a case study where the NUW is described as 'one of the most powerful and reputedly militant Australian unions'(p. 189), but its officials in parliament have been bailiwicks of the modernising Labor right. A review in the New York Times of a new 'mockumentary' based on the assumption that the South won the American civil war. The review is not very favourable, but it made me think about the shortage of this 'alternative history' genre in Australia. Perhaps because Australian history seems fairly placid and predictable (even when not placid) there have not been very many efforts at this genre. There was a war on the frontier between settlers and aboriginals but here was never any doubt about who was going to win. In recent political history there are some examples however. What if Labor had won in 1961, would the modernising politics of JFK or Harold Wilson had come to Australia a decade early, would Labor had won the electoral reward of the economic recovery, would the DLP have collapsed a decade earlier as it finally did when Labor did take office? 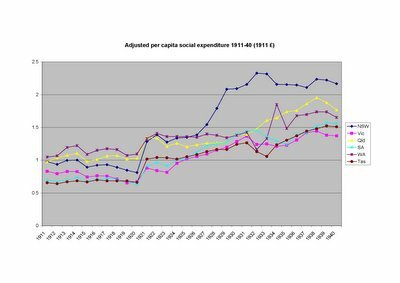 On the other hand the 1957-60 New Zealand Labor government made little impact. The great unanswered question in Australian political history is what would have happened if Lang had refused to accept his dismissal in May 1932, was civil war a possibility? What would have the role of paramilitary conservative forces such as the Old Guard and it’s more populist and neo-fascist rival the new Guard. There have been American cases at the state level of rival administrations after disputed elections, but they have never been in the context of mass political polarisation, and they have been no more than comic opera standoffs. Andrew Moore's The Secret Army and the Premier is an outstanding book on the paramilitary right in NSW in 1930-32, but he is reductionist in downplaying the significance of the New Guard on the grounds it lacked the support of monopoly capital, the same was true of Hitler, German big business distrusted the Nazis (as argued by Henry Turner with apologetic intent), but the Nazi’s popular support swept aside big capital's preferred political allies. What if the New Guard had called on Lang's opponents to come out onto the streets? 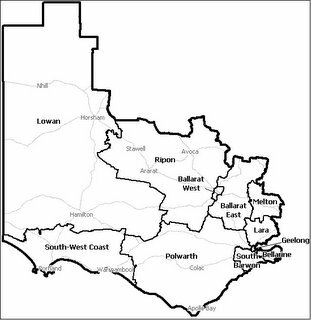 What if the north coast and Riverina has declared their support for the conservatives (shades of West Virginia’s secession). Any overt conflict would have initiated a process of radicalisation with uncertain consequences. Who would have predicted the Yugolslav horrors of the 1990s earlier? Thoughts on 1975 later. A survey of happiness by federal electorates undertaken by my University has been interpreted as evidence that money can't buy you happiness because the electorate with the highest level of well-being and community is the poor rural electorate of Wide Bay, and the unhappiest being the latte left electorate of Sydney. Wide Bay is a safe conservative seat (although it traditionally has shown high levels of support for the populist right, One Nation in 1998 and it was almost won by Social Credit in 1937) so some of them must be unhappy about something). Sydney MP Tanya Plibersek onto something when she cites the income gaps in Sydney between yuppies and the indigenous population as contributing to unhappiness. Same pattern in US as shown by James Galbraith where poor people vote Democrat but poor states (which have less income inequality within the state) vote Republican. Andrew Leigh suggests we should look at revealed preference; the population of Sydney electorate is increasing which suggests people are making themselves happier by moving into the electorate. Happiness research divides the left. The post-materialist left cite evidence that high-income earners are not happier as evidence against economic growth, whereas the old left would argue that the happy poor had false consciousness, proponents of labour market deregulation argue casual and insecure workers not distinctively unhappy but others argue that insecure and casual workers lower their expectations (and this is the traditional approach in industrial sociology as displayed this 1971 book by Alan Fox long before anyone thought of happiness research). I agree with Fox. The National Party's woes have revived speculation about whether it should continue with coalition with the Liberals, or try to strike out on its own, reforming itself as a rural populist centre party that could potentially work with the ALP (for some background see Anthony Green here) In the 1920s the Country Party had a major strategic debate (covered in Graham's Formation of the Australian Country Parties) before opting for the conservative coalition strategy. Sections of the old Country Party have advocated a centre party strategy in the past, but the last time the Country Party (strictly the breakaway 'Country Progressive Party') actually supported Labor in government was in Victoria in the 1920s until the entry of the South Australian National into the Labor cabinet last year. Victorian Labor on occasion supported the Country Party to form governments as late as 1950s. The sticking point however between Labor and the Country Party in Victoria was electoral law, with the Country Party defending a strong rural weighting, and this led to the collapse of their alliances. In 1970 the Victorian Country Party directed preferences to Labor and as a result Labor for the first and only time since the Labor split of the 1950s won electorates in south-west Victoria, but the pact with Labor was unpopular among Country Party voters, it lost 4 seats and its vote fell by almost a quarter. What do rank and file National voters think? Government services and taxation perhaps even industrial relations (now that union militancy is so weak it is no longer feared) may establish points of cooperation with Labor but environmental regulation and ‘hunting and fishing’ divide the two parties. The fate of the South Australian Nationals at the coming election will provide a hint. In 1962 Don Aitkin surveyed Country party members in NSW (always the most conservative division of the party). He found that 45% supported cooperation with the Liberals and were hostile to any suggestion of alliance with Labor, 14% favoured cooperation with Labor and were opposed to cooperation with the Liberals, 17% favoured cooperation with either Liberal or Labor depending on circumstances and 24% wanted a strategy of pure independence. Rare coverage in The Australian on Hillary Clinton's views on economic policy expressed in a speech to the United Auto Workers, the article accuses her of protectionism. If you don't have a strong labor movement in a free market economy, people will take advantage of workers...People will have unsafe work conditions. They will pay you as little as they can get by with. They won't provide benefits. The Democratic strategy for appealing to middle class economic interests strikes me of consisting of little more than saying "the middle class" a lot in speeches. That's a start, but evidently it's not as convincing as it might be. 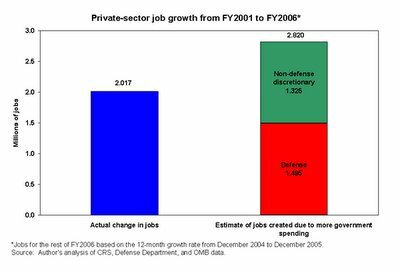 Similarly, the Democratic message on jobs and growth seems heavy on the insinuations that Indians are going to steal your job and short on convincing explanations of what, exactly, Democrats are going to do about this. The ALP doesn't even have protectionism to fall back on. After returning from the United States and navigating airport security I joked that it was no wonder unemployment was low given the number of Homeland Security staff. Turns out I was right, this graph from the Economic Policy Institute (via Nathan Newman) compares overall job growth under Bush with jobs generated by public expenditure, all the job growth is due to the public sector, despite large regressive tax cuts that were supposed to generate private sector growth. Perhaps we should thank Osama for saving American capitalism! The US experience is directly relevant to Australia where calls for tax reduction are justified on the grounds that there is a budget surplus (as under Clinton before Bush) and it is argued that tax reductions will have dramatic supply-side impacts (workforce participation is the popular one) that makes concerns about budgetary balance irrelevant. The New Labour project failed partly because these are very caring people who have lived very comfortable lives. Their policies are often ineffectual because of that. The key thing is recognising what's happening. Just wanting something to be better doesn't mean it happens. They thought [in the mid 90s] that by not doing really horrible things, things would get better; thinking that moving the rudder slightly would help. An apt description of a future Australian Labor government? As Melbourne University Students' Representative Council president in 1988 he did a good job in effecting the merger of the separate student representative bodies at the University and Melbourne CAE into a single Melbourne University Student Union. Pity this union was later destroyed by members of the Labor faction he later joined. He seemed to do a reasonable job as National Union of Students secretary in 1989, the only comment of his I remember was one questioning the obsession with calling student organisations 'unions', I am now inclined to agree with him on this. In Isaacs it seems Anne Corcoran in for the chop, her father famous as a young Catholic activist who stood up to the Groupers in the early 1950s, he continues to write and speak on his experiences. I wonder if those organising to replace her remember that she was put there by the votes of the right solely to kept the dynamic and very talented Jill Hennessy out of parliament, she having already been defeated for the Holt pre-selection by the very unimpressive Anthony Byrne to succeed Gareth Evans despite having won the local ballot. Jill was I think the last Labor student to seriously run under the 'Labor students' banner in a student association election, losing the 1992 Monash Association of Students election for Chair by 8 votes. Somehow I doubt Jill will receive any apology, however much it is deserved, or that she will be recalled as a candidate by those touting ALP talent. Harry Jenkins in Scullin in trouble, I must admit there were times when I thought Ted Murphy had more to offer, see a speech by him here. Ted was defeated for the Senate in 2001 by Lyn Allison on Green preferences, even though he is probably closer ideologically to the Greens than her, still after Labor's performance in electing Families First over the Greens in 2004 Labor has nothing to complain about. However the policy statement by the group whose candidate hopes to replace Jenkins, 'the Union and Community Alliance' was one of the laziest and cynical documents I have ever seen, a collection of clichés and glossy print. The current model predicts a net Democratic gain of 10 seats. When we factor in a four-seat margin of error, the model projects that as of today, under current conditions, and without speculating about what the national political environment may do between now and November, Democrats will make a net gain of six to 14 seats. With a bit of luck -- or a wave of any size -- Democrats might even grasp their gold ring: 15 seats. This is encouraging, but remember that a good Democrat performance in 2006 might be followed by a slight regression in 2008 (even if the Democrats win the Presidency), and a narrow Democrat majority will hardly offer much hope of progressive legislation. This could change if the Republicans crash and burn, but although the economic recovery looks unexpectedly sluggish (with quarterly GDP growth down to its slowest rate in 3 years at 1.1%) I doubt this will occur. The NSW ALP government wants school classes on Australian values. As a civic nationalist I think there might be something to this, if it is about egalitarianism, mateship and the fair go, as suggested in Imagining Australia (although my view of how to achieve these objectives might be more old Labor than the authors). I will see what my students in Australian Identities think. Australia is a nation of abundant wealth  in our environment, our people, in our diversity and in our spirit. We are able to care for all our citizens. That we do not is a burning injustice. I could not and cannot accept that in a wealthy nation like Australia we tolerate the poverty, the violence and the plain unfairness that too many Australians experience day after day. We all deserve the opportunity to live with dignity. We all deserve to be treated with respect. None of our citizens should be shut out of our nation's prosperity. There was a time when NSW Labor led Australia in the battle for these values. Maybe the Premier seeking strategies for re-election should look back to the past history of his party. 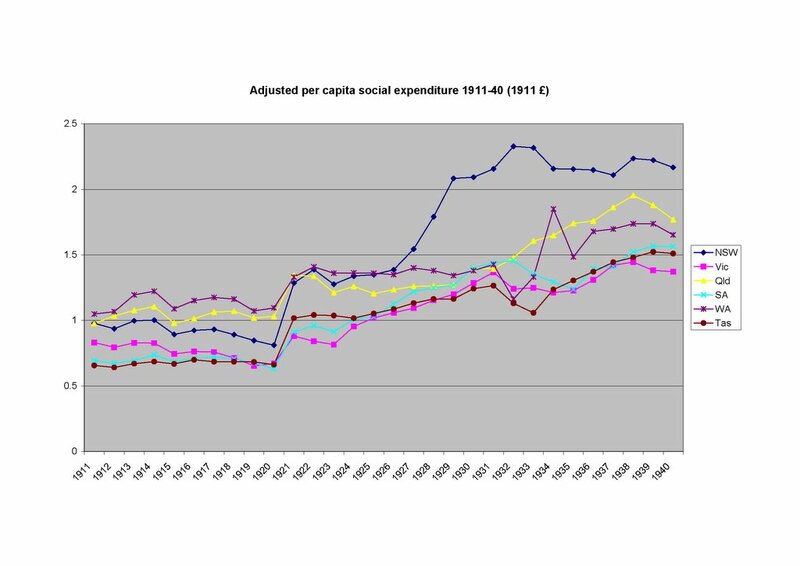 Once between the wars when NSW led Australia in social expenditure as this graph shows (blue line on top is NSW), to return to this example would put Australian values into practice (for more on this graph see my APSA 2005 paper here). For the completely opposite view on Australian values see Tom Bramble here. Precisely because of the prevalence of Islamist thinking, its use by ruling elites, and its compatibility with economic development, "it is essential," the text continued, "to supersede Islam with materialist thought." I would argue that the events of the past 25 years have underscored its validity: Islamist ideologies have indeed been able to flourish alongside economic development, but they have equally served to confuse, divide and divert the peoples of this region. This has been the case with the obscurantist and authoritarian variant of Saudi Arabia, copied to varying degrees by other Gulf regimes, as well as with the demagogic and self-defeating rhetoric of the Islamic Republic of Iran. Finished reading Gary Gerstle's brilliant American Crucible, which is full of material that was new to me and new ideas, such as the commonality between Woody Allen and the Black Panthers! Did civic nationalism come to Australia with post-war migration in the 1950s or with official multiculturalism in the 1970s? His reading of the 1912 presidential election is very interesting and bolsters the case for Teddy Roosevelt’s radicalism (I was reminded of another brilliant book that discusses TR: Martin Sklar's Corporate Reconstruction of American Capitalism). Both Gerstle and Sklar show the type of history-writing we need now. From a contemporary Australian viewpoint the description of the decline of civic nationalism has especial resonance. In the history of the 1960s Gerstle highlights the rejection by the Democrats of the claims of the Mississippi Democratic Party to be seated as delegates at the 1964 Democrat convention as a crucial moment in the break-up of the liberal consensus and the demise of civic nationalism. Could we see Labor's capitulation on asylum-seekers in 2001 as similar? Did it fundamentally alienate a generation from Labor? I recall hearing David McKenzie who was a Labor candidate in 1966 and 2001 describe his differing feelings of election night, in 1966 feeling that at least they had fought the good fight but in 2001 miserable with the consciousness of Labor's moral failure (he has some further musings on the state of the ALP here. )'Realists' might say that what counts is seats in parliament, but very soon after the 1966 debacle Whitlam had the Coalition on the run and 6 years later Labor swept to power, 4 years after the brilliant damage control exercise of 2001 Labor has gone backwards and at the Victorian election this year Labor will have to have battle to defend Melbourne and Richmond against the Greens, which 10 years ago would have been inconceivable. In the American context things fall apart in the late 1960s, in Australia in 1972-75, but what falls apart is quite different. Verso is a leading radical publisher, the successor to the old NLB (New Left Books). NLB pioneered the publication of the great works of European Marxism in English. It has just published a collection of the statements of Osama bin Laden. I suppose there is some use in having a collection of these statements available, and I will look at the book, as I have to teach about religious fundamentalism in AIP 116 Modern Political Ideologies at Warrnambool. There are some interesting comments on the book at Spiked (better than their usual by-the-numbers libertarianism) and it has inspired reading groups. Fiona Capp in today's Age calls bin Laden's arguments 'rational, elegantly composed polemic'. It seems to be more a case of how the far right plunders the language of the left for its own purposes as Franz Neumann argued in the brilliant Behemoth. But I have to feel that the publication of bin Laden's works by Verso says something about some aspects of 'the left'. 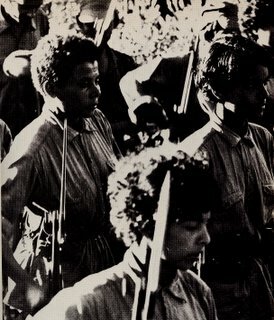 In 1970 NLB published Armed Insurrection a translation (by Quintin Hoare who now keeps different company than some in Verso) of a Comintern manual, but now the street-fighting days of the 1970s are long past and now there are other political models for the disaffected. Not progress to me. We acknowledge that in the achievement of that outcome, the AWU did not consult or did not adequately consult either its affected membership, or the workforce whose industrial interests it is empowered by the Act to represent. The officers of the AWU participated in ACTU conferences with other nationally registered unions about the union organisation campaign in the Pilbara, and the associated negotiations for collectively bargained conditions of employment for Hamersley workers. On the evidence, the AWU representatives failed to disclose to those meetings the collateral, confidential and without prejudice negotiations that Mr Shorten and Mr Ludwig for the AWU had taken to an advanced stage by April 2003. That conduct by the AWU may reasonably be described as duplicitous or untrustworthy by other participants in the ACTU or PMU processes. The case for the AWU may have been strengthened by the pending demise of the state system under the new IR legislation but this wasn't something that was anticipated in 2003, and this doesn't affect the evaluation of the AWU's behaviour in negotiating in secret. Exciting news, the newly discovered 'tenth planet' 2003UB313 has been confirmed to be bigger than Pluto. Unfortunately New Horizons won't go near it, but at the rate these large Kuiper belt objects are being discovered perhaps a similar 11th (12th?/ 13th?) 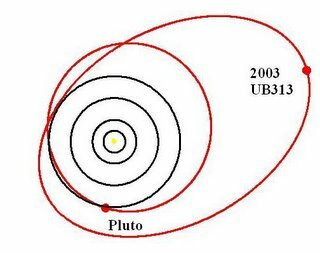 plant can be observed after the Pluto encounter. Tony Blair has been defeated on religious hatred legislation after a backbench rebellion. Revolts.co.uk details the story and provides comprehensive information on party revolts. These never happen in Australia (recently anyway), Senator Joyce being the only very minor exception. This is often seen as result of Labor’s early commitment to caucus solidarity and the emulation of this by the conservatives. But if you look at the early versions of the Labor pledge in NSW here it was more open, even the 1893 NSW Labor pledge which lead to a major party split specified criteria (although broad) to determine what votes were caucus bound and the 1895 compromise pledge required caucus voting on matters affecting the Labor platform and the fate of the government. The caucus split on the premiers' Plan can probably be classified as extraordinary circumstances but Sawer notes in passing that some Labor members in 1930-31 voted against tariff increases (p. 29). True Believers notes that the first federal Labor caucus was only bound on Platform questions (p. 31) but I don't think it explains anywhere how caucus solidarity was extended to all legislation. Now it is absolute and even the Labor factions in student politics have adopted it, at least when I was about (for this student politics in practice with its Comintern style hysteria see here). Two points: 1) this is a gap in Australian political history; 2) would the ALP benefit by a British-style approach that enabled MPs to revolt? Some would hopefully anticipate inner-city Labor MPs rebelling on social liberalism i.e. asylum-seekers against a pragmatic leadership, but on the other hand the failure of American unions to get ‘their' party' (the Democrats) to support labour law reform suggests that caucus dissent could be to the right as well as the left. An ABC news report citing the East Timorese Truth and Reconciliation Commission takes as news that Alexander Downer wanted Indonesia to delay a plebiscite on East Timorese independence. Is anyone surprised? The government sponsored Facing North says that Downer always supported 'a lengthy period of autonomy followed by an act of self-determination' (12 January 1999) (p.227) and Howard's letter to President Habibie of 19 December 1998 declared that Australia believed East Timor's interests were best served by remaining part of Indonesia(p. 228). Only ignorance and myth-making such as that of David Flint who seeks to exempt the Liberal party from the blame it shares with Labor on this, can denyHoward's Suhartoian enthusiams (Gerard Henderson is good on this here). This stranglehold of the disaffected and dyspeptic in many key areas of the humanities and social sciences has had quite dire consequences. The first is that in these areas Australian universities have ceased to be national institutions and have become instead strongholds of minority sectarian views. To be a national institution, a university has to be as comprehensive as possible. It has to include within itself as broad a range of intellectual positions as is feasible. Unfortunately in the recent past this often meant a full range of Marxist ideologies from Stalinism to Trotskyism to Maoism. More recently feminism and postmodernism have been added to this list. Since their takeover by the Left, many universities have used their position to try to indoctrinate future generations of societal elites against the very values upon which our civilisation is built, which constitutes a total reversal of their original mission. There is an urgent need to think of means that would restore balance to the universities and return them to their original role as the guardians of our civilisation and culture. This is something with which conservative thinkers and policy-makers have not as yet come to grips. The final challenge facing Australian conservatism is to become better organised. There remains a great gulf between the intellectual forces of conservatism operating in think-tanks, business groups and isolated pockets of academe on the one hand, and the political forces of conservatism sitting in the various Australian parliaments on the other. There is a need for better communication and co-ordination between the intellectual wings and the political wings of conservatism. In a sign of the times, the test for disloyalty has shifted far toward the center. Once an unreliable professor meant an anarchist or communist; now it includes Democrats. Soon it will be anyone to the left of Attila the Hun. Second, the charges do not (so far) come from government committees investigating un-American activities but from conservative commentators and their student minions. A series of groups such as Campus Watch, Academic Bias and Students for Academic Freedom enlist students to monitor and publicize professorial conduct. Third, the new charges are advanced not against but in the name of academic freedom or a variant of it; and, in the final twist, the new conservative critics seem driven by an ethos that they have adopted from liberalism: affirmative action and a sense of victimhood, which they officially detest. In his State of the Union address last night the President drew attention to the difference between critics of the war in Iraq who want us to win the war on terror, and critics who are "defeatists" -- who want us to lose. Cindy Sheehan who was arrested attempting to disrupt the President's speech and her patron Michael Moore want us to lose. They are not defeatists (the President is as always polite) but traitors. Not in the Constitutional sense (which is very strict) but in the sense that really matters -- morally. They are willfully betraying us to our terrorist enemies. if Tony Abbott had become federal education minister I thought this theme may have been taken up at the level of government, but for the foreseeable future I suspect Melleuish and Briant will remain on the fringe..hopefully. to conduct on behalf of the Crown as respondent, any appeal in any court in respect of any such prosecution. he creation of a Director of Public Prosecutions changed the administration of criminal justice in New South Wales: day to day control of criminal prosecutions for New South Wales offences passed from the Attorney General to the Director of Public Prosecutions (the DPP). As a result of the Act there now exists a separate and independent prosecution service. That independence is a substantial safeguard against corruption and political interference in the criminal justice system. "A coalition government will establish an oversight committee in parliament to oversee the office of the DPP, and its performance," Mr Debnam said. "And it will also limit future appointments of the DPP so they are appointed for seven years, not for life." Generally the defense of DPPs in Australia has been a progressive cause, reforms by the Kennett Liberal government in Victoria to the position were particularly controversial and Labor campaigned against them and reversed them. I have always had my doubts would ridiculous prosecutions such as those of Queensland chief magistrate have occurred if the decision to prosecute had been subject to review by the Attorney-General? I can see the argument for the DPP's independence but it is not an unqualified good.